With dependent form fields, you can easily ask your contacts further qualifying questions based on their previous answers. For example, if your business only sells to clients in certain geographic locations, you can qualify form respondents by country and state/region. In the form editor, hover over a form field to add dependent fields to and click the pencil icon edit. If [field] 1: this dropdown menu has the options: is equal to, is not equal to, contains, doesn't contain, starts with, ends with, is not empty. The options vary depending on your form field type. In this example, only one country will meet the criteria, so the is equal to option is selected. If [field] 2: enter or select the value(s) that the visitor must input to be shown the dependent field in this text field or dropdown menu. In this example, the specific country to be input is United States. Then show: select the field to display if the visitor meets the criteria set above. 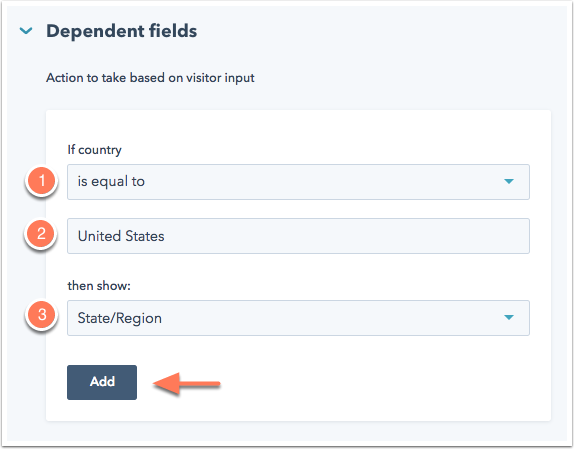 In this example, if a visitor selects United States as their country, the State/Region field will appear on the form. To build out more dependencies for this specific field, click + Add another rule in the Dependent fields option. After setting up your dependent form fields, you'll see the dependent field(s) connected to the field it is dependent on with a dotted line. Click Open dependent fields (x) to view the specific dependencies. To test your dependent fields, click the Style & Preview tab. In the form preview, enter the value(s) that meet the criteria set up for the dependent field in the field it is dependent on. The dependent field will then appear. In the example below, the State/Region field appears after entering United States in the Country field. In the upper right, click Publish.